Dang it’s been cold…. and unfortunately another round of this “polar vortex” is sweeping across the Midwest as I write this post. 30 years of living in this tundra and yet I had never experienced air temperature of -22 degrees F, a chill that’s hard to describe in words except absurd. But then again we’ve talked about moving somewhere warm many times, yet there’s something I love about being able to bundle up, hunker down, and stay inside with a new cooking project to pass the time, like this Chai Pear Butter. After hearing Brenda from A Farmgirl’s Dabbles wax poetically about Harry and David’s famous Riveria Pears several times, I’d been itching to order a box myself. Thankfully, I stumbled upon a great deal and soon my friend Kate and I had two boxes coming our way. I waited a few days and once I could smell a little sweetness from the stem area (that’s a sign they’re ripe), I closed my eyes and took my first bite with high hopes. As my teeth sank in and the flesh gave way, the sugary juices dripped down my chin….. and all was right in the world. Wow – it was smooth, sweet, and buttery, unlike any grocery store pear I’ve ever had. Fruit butters are very forgiving and easier to make than jam, no “setting” required. You simply simmer the chopped fruit in a bit of water until soft, puree it in a blender, and let it cook down on the stove just until it’s the thickness you desire. As you can see, I left my on the stove for about four hours to achieve that deep, caramelized color and flavor. Take inspiration from wherever you like to make the recipe “your own”, adding your favorite spices or herbs that compliment the fruit – there really are no rules! Little sugar or honey in this case is needed, as the puree becomes sweet and intense as it simmers away into a lush spread. My spark to make this came from the “The Kitchen Pantry Cookbook”, which has some seriously great homemade goods in it, like Chai Pear Butter. The recipe is brilliant, steeping the pears during their first 30 minutes with two bags of high quality chai tea. Not one to just leave things alone, I tweaked the recipe by scraping in the seeds of a vanilla bean to give it something special while intensifying that delicate, sweet essence of the pears themselves. Every time I see those tiny black specks adorning something I’m eating, it brings me back to my childhood when Mom would bring home Breyer’s vanilla bean ice cream, a rare treat since it was much more expensive than plain vanilla Kemps in the red handled quart pail. And instead of sugar, I only needed to use about 1/4 cup of my favorite local honey made by Ames Farm for a completely naturally sweetened fruit butter. And then I couldn’t help but add a pinch of cinnamon and freshly grated nutmeg to bring it all together. 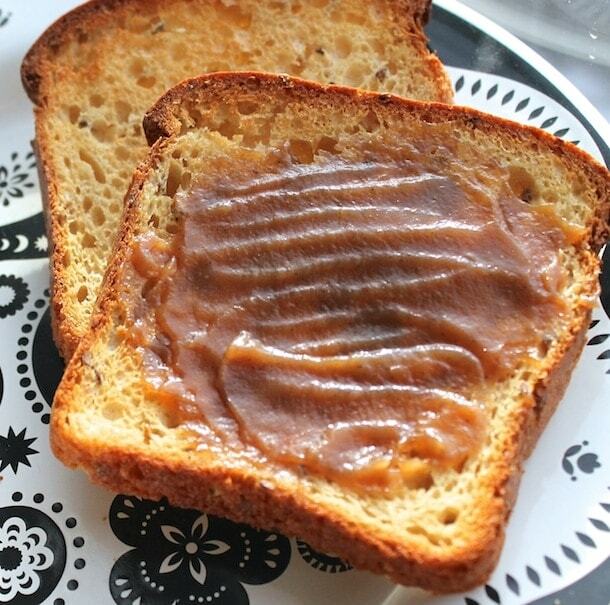 Spread on a warm piece of gluten free toast – ugh, it was like heaven. I can’t even image what it would be like on a piece of fluffy brioche….. It turned a bowl of everyday oatmeal into a gourmet breakfast. And served alongside Prairie Breeze cheddar and a glass of red wine, well that’s my idea of a “home alone” dinner. Because I wanted to ration this decadence knowing I would eat it all within a week, I water bath canned 2 – 4 oz. jars and kept the remaining in the fridge. No need to can if that’s not your thing. The 1/2 pint will last 3 weeks in the refrigerator. Place the pears, water, and chai tea bags in a medium-size saucepan. Bring to a boil over high heat. Lower the heat and simmer until the pears are soft and mushy, about 30 minutes. Remove from the heat and allow to cool to room temperature. When the pears have cooled, remove the tea bags. Purée the cooled fruit in a food processor or blender until smooth. Return the puréed pears to the saucepan. Stir in the honey and vanilla bean seeds. Bring the purée to a low simmer and cook, stirring regularly, until the purée has thickened and is spreadable, about 2 to 3 hours, or longer depending on how thick you would like it. The butter will thicken slightly as it cools; however, make sure you feel it is thick enough before you remove it from the heat—think jam. When the butter has thickened, remove it from the heat and stir in the lemon juice, cinnamon, and nutmeg. Pour the butter into a clean jar and refrigerate for up to 3 weeks. To water bath can: Pour the hot fruit butter into sterilized clean jars, wipe rims, apply lids/rings and process in a boiling water canner for 15 minutes (starting the time when the water returns to a boil). When the time is up, remove the jars from the water and let them cool on a towel-lined countertop. When the jars are cool to the touch, check the seals by removing the rings and lifting the jars by the edges of the lid. A good seal means that the lid will hold fast. For step by step canning pictures, this is a great tutorial. Yum! I had two super ripe pears leftovers from a christmas gift. I scooped them into my small blender with some cinnamon and honey, froze it, and it was a delicious pear “smoothie”. Katie, that sounds great! It would be a good change for me instead of using bananas in my smoothies all the time. I will have to try it! 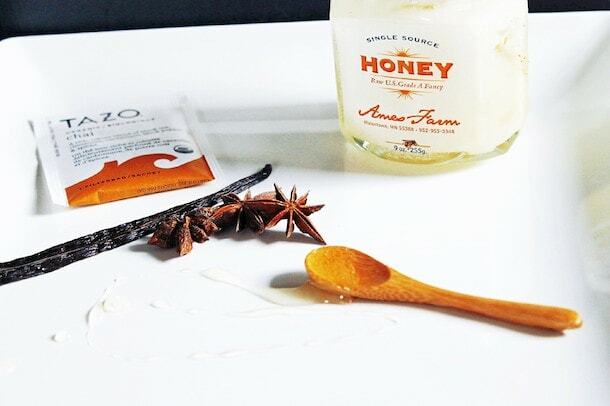 I am obsessive about Ames Farm honey. I think I have seven different varieties right now, but my favorite is the Basswood when it has started to crystallize. I love the chai flavoring in this pear butter. I am obsessed with their honey too! This was the Summer Blossoms… and yes, the crunchy little crystals are the best. Hope you and the family are doing well! Oh my goodness, this sounds delicious. Definitely saving this recipe for a home alone dinner soon for myself. Hi Stephanie! Keep thinking of you and your little one on its way. So exciting! Grandma, thank you. So nice. Muah! I’d be thrilled if you found another deal for these pears, because then I could make a batch of this myself. I was so busy eating the deliciousness that the only thing I did with them otherwise was put them in Gingerbread pancakes. I might have to cave in and buy some Bartletts to make this. I spotted this on foodgawker and I can’t wait to give it a try! It looks like it would be delicious on my morning toast or added to panini with prosciutto and some stinky cheese. Thanks! Hi Sarah! Thanks for stopping by – I have used this pear butter in several ways, have to say it was quite good in a yogurt parfait too! Forgot to let you know how the braised cannellini beans dish of yours turned out! I used the chicken thighs instead of beef as I asked you about on twitter and we loved it! I still need some work on cooking white beans… even with soaking and slow simmering, they still don’t get the creamy consistency I want. Any suggestions? My only suggestion would be to cook them even longer…or just give in and use canned beans! My name is Michael E. Rubin, and I work as the Social Media Marketing Specialist for Harry & David. Thank you for sharing your recipe and the photos. You made a lot of mouths water over here, especially when you started using words like “intense” and “lush.” We’re delighted you enjoyed the pears and found such an inspiring use for them. Hi Michael! Thanks so much for commenting and stopping by. I can’t tell you how much I loved the pears. I made several things with them, including a caramelized pear dutch baby and a caramelized onion, pear, & blue cheese galette. There truly is nothing that compares to them. I look forward to ordering again and trying some of your other fruits. If you and your team would ever like to work together on a post I would be delighted to share with my readers! A perfect pear is my favourite fruit! Hard to come by good ones in a grocery store. I was lucky this summer to be able to buy Colorado local pears from our Western slopes and like you I had juices running down my chin and arm. I haven’t tried Harry and David pears ado I’m going to look out for them. This fruit butter looks amazing. I love the look of that honey too! Hi Nazneen!Thank you so much for stopping by. I’ve heard that Colorado pears are good too, as well as the peaches right? If you get the craving, you can order from Harry & David online like I did. They even made it here safely with all the cold we’ve been have. Your blog is lovely too. So glad I found it earlier this week through your Parsnip Cake post! My mouth is totally watering, WOW! This sounds incredible! Thanks for stopping by Emily! It’s a breeze to make too. Now if I could just get a lifetime supply of those pears! Oh yum! 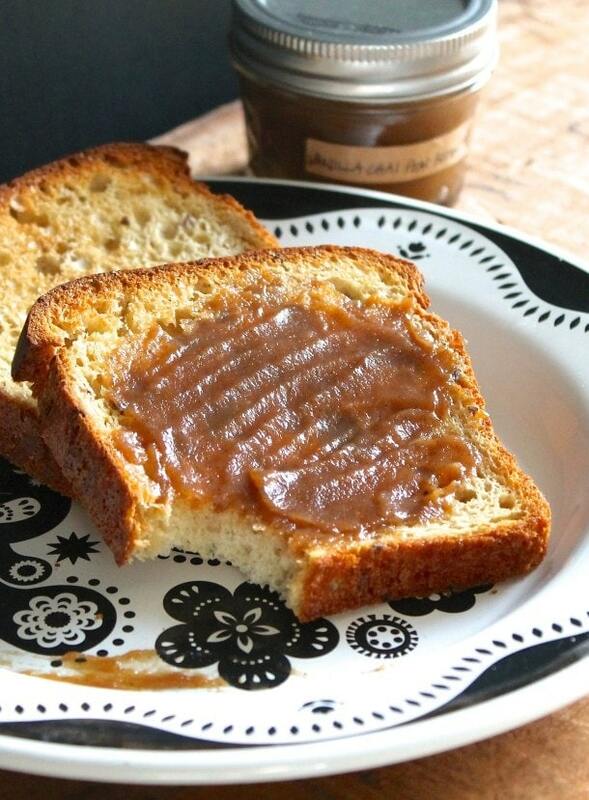 I have never made pear butter but love the idea of adding in Chai! Hi Jennifer! This was my first time making pear butter too and it won’t be my last. 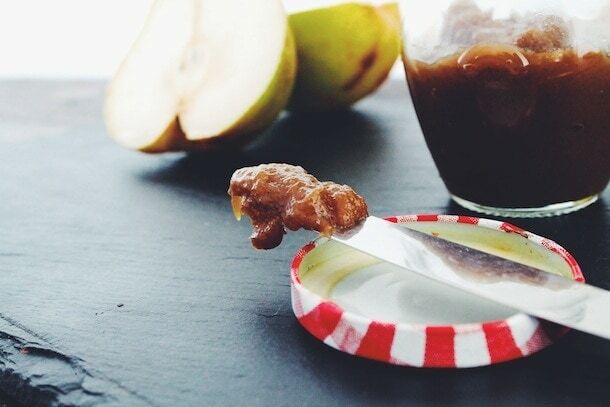 I think an apple butter with chai spices would be great too! I looooove this flavor combination. I never really make fruit butters because I feel like I am the only one in my house who eats them, but I think I need to try this! Pinned! Got 8 little pears in my Bountiful Basket this week, had all the ingredients on hand so I made this butter… Oh my Holy YUM! It smelled fabulous while it simmered, tasted even better! Thank you, thank you! Good lord this is tasty! Made this in our slow cooker and used Prana Chai’s masala for this -way better than the cheap tea bags (read about them here http://www.pranachai.com/our-story/ – we order it in bulk from the company as they have a US distributor yay!). Oh so glad you enjoyed it Aimee. And right on about using a great chai, it does make a difference! 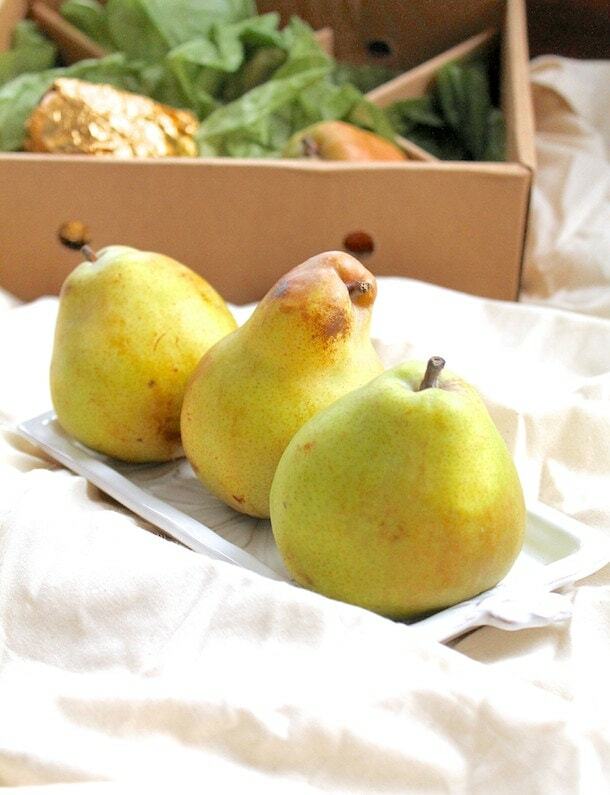 I am making holiday jams and wanted something with a pear…. this is it! I’ll make it this week and definitely let you know how it goes. :) Now I have satsuma cranberry marmalade, gingerbread jam, and this one. Thank you! So, the first batch was more of a sauce, and needed to be thickened. Second batch, I soaked the chai tea bags in a little hot water and just threw in with the pears without the added water, and a little pectin. Needed much more chai flavor and lemon juice, but overall those favors worked very well together! I processed, wrapped up, and labeled them “partridge in a chai tea” spiced pear jam. “That’s my jam” I typically jam with my bread machine or pressure cooker. With the pressure cooker, I process on high pressure for 90 minutes, then blend apples or pears, take out tea bags or other simmering items, check consistency, and usually it will need another 30-45 minutes in the pressure cooker to finalize the batch. That’s when I get my canning pot going with hot jars so they’re ready when the jam is. When you say purée the cooled fruit then return to th pan, did you discard the liquid they’d cooked in, purée it with the fruit …? Hello! Puree with the liquid, don’t discard. So, if I’m reading this recipe right – this only makes enough to fill ONE 1/2 pint jar? Whoa, I’m going to need a bigger kitchen, to make a flat of it – LOL! Yes, a little more than a half pint! You can definitely double the recipe if you’d like.